A carefully crafted, open-to-everything mixture of live-wire reality and controlled narrative, Medium Cool is the debut fiction feature of Haskell Wexler, who had already established himself as one of Hollywood’s premiere cinematographers in the post-studio-system-era on such films as Elia Kazan’s America, America and Mike Nichols’ Who’s Afraid of Virginia Woolf?. In 1968, he hurled himself into the tear-gas of the cultural-political moment. The result was, alongside Bonnie and Clyde and Easy Rider, a seminal early work of what came to be known as “the New Hollywood”. John (the prolific Robert Forster, who would find latter-day fame in Jackie Brown, Mulholland Drive, and Breaking Bad) plays a television cameraman who has become disenchanted as a creative subservient to the mainstream. Eileen (Verna Bloom latterly of High Plains Drifter and After Hours) depicts a newly relocated war-widow swept up in the maelstrom of the conflicts of the 1968 Democratic National Convention in Chicago — the actual events of which serve as the spontaneous backdrop for Wexler’s picture. Documentary and narrative blur in the upheaval and chaos, and perhaps only Peter Watkins’ Punishment Park stands analogous as such a powerful statement on the politics, media, and cinema of the late-‘60s — and the present. 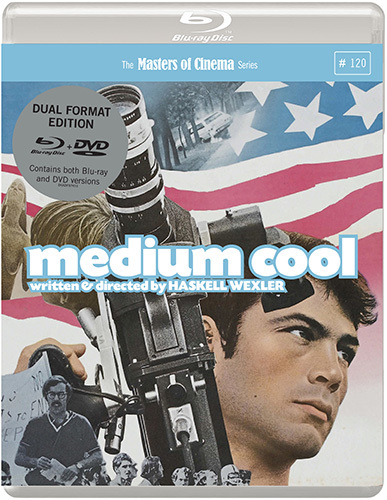 The Masters of Cinema Series is proud to present Haskell Wexler’s Medium Cool for the first time in the UK on Blu-ray and DVD.